Changing a battery is easy and worry-free. In some cases you won't need any tools, and in some cases you'll need a flat head or a Philips screwdriver. We've even got videos and instructions to guide you through. Please make sure your Homelife system is disarmed prior to changing the batteries in any of your Homelife devices. Then call the Central Monitoring Station at 1-800-633-2677 to put your system into test mode. This will prevent your system from triggering a false tamper alarm. 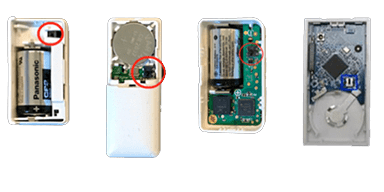 Please also be sure to note the polarity shown in the battery compartment and match the + and – signs on the ends of the batteries where indicated on the device. IMPORTANT! Please avoid pressing the tamper switch on the inside of your door/window sensors when swapping out the battery. Pressing the tamper switch will cause your sensor to reset, and require a technician visit to reconnect it. Locate your device below for battery specifications and replacement instructions. See available Homelife equipment and how it all works together. Learn more about managing your Homelife service and how to troubleshoot any issues. See Cox Homelife plans and pricing or add additional equipment to your existing plan. See Cox Homelife service details. See important information in the Residential Customer Service Agreement for full coverage details. See Annual Notice information for related information and your privacy rights as a Cox customer. See also the Annual Customer Notices. For all Cox Communication policies regarding our services and business practices visit www.cox.com/aboutus/policies.html. Cox Homelife Service provided by Cox Advanced Services: Arizona, LLC - ALARM License No. 18141-0, ROC License No. 310876; Arkansas, LLC – License No. E 2014 0026/CMPY.0002278; California, LLC–Alarm License #7196 & Contractor’s License #992992; Connecticut, LLC–License #N/A; Florida, LLC–License No. EF20001232; Georgia, LLC–License: Bryan David Melancon #LVU406595; Idaho, LLC 024933; Iowa, LLC– License #C121646 & AC268; Louisiana, LLC–License F 2006; Nebraska, LLC–License #26512; Nevada, LLC dba Cox Homelife – License #78331; Ohio, LLC–License #53-18-1671; Oklahoma, LLC–License #2002; Rhode Island, LLC–License #9314; Kansas, LLC – Topeka License No. 109 & Wichita License No. 2015-36492; and Cox Advanced Services Virginia, LLC–DCJS License #11-7776; DPOR License # 2705164725. Cox Homelife is available to residential customers in select Cox service areas. A high-speed Internet connection is required. Applicable monthly service charges, installation, additional equipment, taxes, trip charges and other fees may apply. Subject to credit approval. Other restrictions may apply. Local ordinances may require an alarm user permit or external lock box.